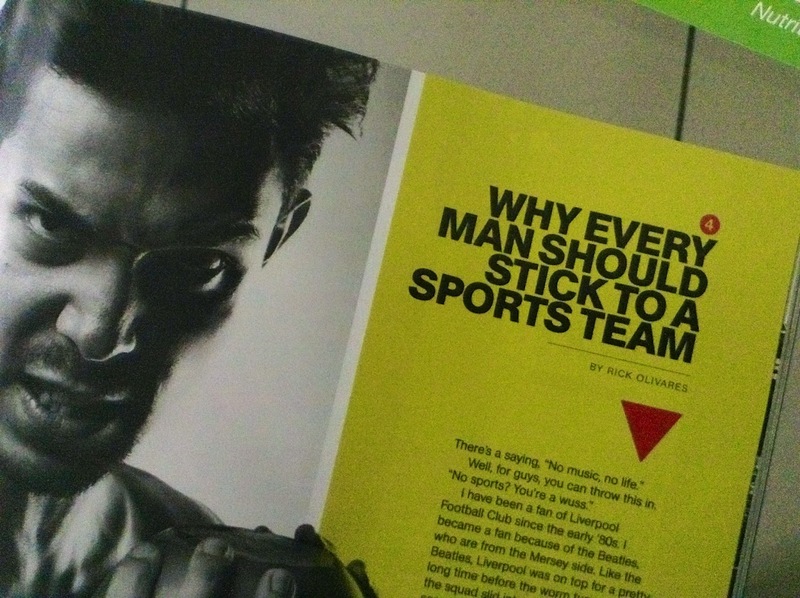 Got a new article for the July issue of Men's Health Philippines! Haven't written for Men's Health in years! There was a time when I was a semi-regular contributor to the magazine. For the July 2014 issue, I wrote about why a man should choose a sports team and root and cheer for them til death do them part. Sure was a blast. For my next assignment for them, it's all about food. It's a welcome change of pace. Before Philippines Free Press closed down, I wrote regularly about climate change, alternative bands, and politicians. For their sports feature, I regularly wrote about Manny Pacquiao. For philstar.com, I get to write pretty much anything I want to. So I am not limited to sports, I do a lot of comic book features and the odd movie review and lifestyle piece. Do I keep copies of what I write? Sure I do. Everything. Maybe one day I will compile my favorites into a book. 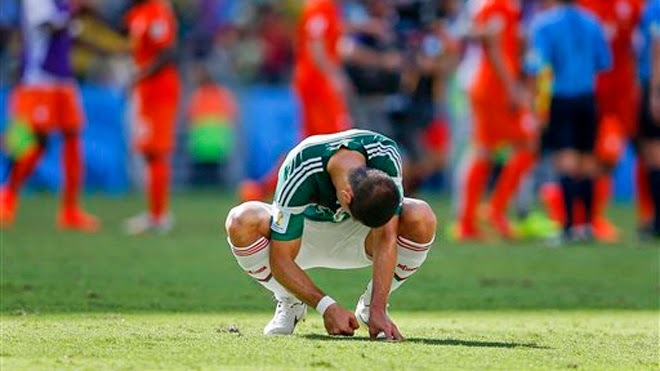 It doesn’t only apply to Hernandez, nicknamed “Chicharito” or “Little Pea” by his countrymen, as it does to El Tri, as Mexico’s national team is fondly called. After all, they won the Olympic Gold Medal. In three stellar Group A matches in the 2014 World Cup in Brazil, El Tri was poised not just for legendary status – more so after taking a point from Brazil for the first time in 29 matches in a scoreless draw – but for greater glory. Then came the shocking and cruel end to their storybook run as the Netherlands scored two goals in the final eight minutes (including stoppage time) to advance to the round of eight. And for the sixth time in Mexico’s World Cup history, El Tri has failed to advance to the quarterfinals. And in a cruel case of symmetry, Mexico’s World Cup campaign mirrors their start of their qualification campaign. After topping the third round of CONCACAF (Confederation of North, Central American and Caribbean Football Associations) with a 6-0-0 record, things fell apart badly. They fell to 2-5-3. They drew their first three matches they defeated Jamaica, 1-nil! One-nil! Then a 2-1 loss at their home pitch of Estadio Azteca in Mexico City, saw the end of Jose Manuel dela Torre’s reign. By the time they faced the USA at the Colombus Crew Stadium in Ohio, Luis Fernando Tena was in charge. But a 2-nil loss with goals from Eddie Johnson and Landon Donovan saw him sacked after only one match (although he presided over their Olympic Gold Medal triumph in London. With an air of desperation as Mexico fell to fourth in the standings, Victor Vucetich, one of the most decorated managers in Mexican football was called upon to resurrect the country’s sagging World Cup fortunes. It seemed that Vucetich, who was called out of retirement was the answer as Mexico arrested their skid with a 2-1 win with the game winner coming at the 85th minute courtesy of a Raul Jimenez strike. But the reverie didn’t last as a surging Costa Rica humbled Mexico a second time with a similar 2-1 margin of victory. Vucetich was gone and Mexico’s Football Federation asked if their biggest local side, Club America, to manage the team. In the two-legged qualification match between Mexico and New Zealand, El Tri, obviously much more skilled, crushed the Kiwis, 9-3, to book their World Cup ticket to Brazil. In that win over New Zealand, Herrera won the hearts of his countrymen by selecting a side that was completely composed of players plying their trade in the La Liga Mexico. Because of the success of Mexican football, players now going abroad, especially to Europe are seen as traitors. In a tournament of this magnitude, Herrera couldn’t simply take the chance. He lined up Villareal’s Dos Santos and his brother Jonathan who suits up for Barcelona as well as MUFC’s Hernandez. The obvious absence was Carlos Vela, the striker for Real Sociedad who is regarded as Mexico’s best footballer but has fallen out with the powers that govern national football. Nevertheless, in a move similar (in some ways) to the exclusion of Landon Donovan for the United States team, Mexico was moving forward. Once in Brazil, they flourished. In their first ever Group A match against Cameroon, forward Giovani Dos Santos saw two goals disallowed for offside despite the first strike clearly on side. However, Dos Santos kept at it and a second half shot that was batted away by Cameroonian keeper Charles Itandje, rebounded towards striker Oribe Peralta who struck home for the 1-nil win. Against Brazil that owned a collective 38-0 record against Mexico, El Tri were outstanding against the host squad but they were unable to get any calls. They had to rely on the superb goalkeeping of Guillermo Ochoa to fend off four strong chances by the Selecao to take a point in a scoreless draw. In their third group match, Mexico and Croatia battled to a standstill until the 70th minute when a Rafael Marquez header broke the stubborn defense of the Croats. Needing a win to advance, Croatia committed more men to the attack and they paid for it when Mexico scored two more goals. An Ivan Perisic goal with three minutes to play was a consolation as El Tri advanced with a 3-1 win. Miguel Herrera’s men tied Brazil with a 2-1-0 record but were seeded second due to goal difference. But it didn’t matter. For a team that didn’t do too well in their own qualifiers in addition to undergoing a last minute managerial change, they had done better than anyone expected. In fact, they looked better with every match they played. Against the Netherlands in the Round of 16, they obviously handled the humidity much better than the Dutch did who wilted in the heat. In the first half, while they repeatedly broke down the Dutch defense, they were unable to beat keeper Jasper Cilissen. Poor defensive coverage allowed Dos Santos to finally score in the tournament but mysteriously, the Mexicans’ play dropped. Whether by design to hold back coupled by the Dutch playing with a greater sense of urgency, they were on their heels as Holland won corner after corner with Arjen Robben slicing through the defense like a hot knife through butter. The Netherlands scored two goals in the last eight minutes including a stoppage time penalty controversially won by Robben to send Mexico home. The animated Herrera who had become a popular figure for his animated displays on the sideline could not hold back his anger and disappointment. He cited FIFA’s decision to send a European referee for the match. He pointed out that an official from a different continent should officiate in order to preserve neutrality. In truth, his squad also sat back rather than attack. His subbing out of Dos Santos for Javier Aquino didn’t help. If El Tri gave the Dutch a lot of trouble on their left flank, Holland coach Louis Van Gaal returned the favor as they racked up a lot of blazing runs from that side. During Mexico’s qualification phase, their most painful loss was their 2-1 defeat to Costa Rica at Azteca Stadium. Their beloved Chicharito had a chance to send Mexico ahead when he found himself with nothing more than an empty net to slot the ball in the 17th minute of the match. However, he bungled his touch and sent the ball to Peralta who was called for offside. But that is all forgotten now. They’ll remember Fortaleza where Mexican hearts were broken like never before. The Wesley Sneijder hammer strike in the 88th minute (and the Dutch midfielder was mostly a woeful sight all match long) and Arjen Robben dropping inside the box from a foul by their captain Rafael Marquez. It is a brutal and cruel way to go out especially for a side that played so well. El Tri left Mexico with a lot of hope. They’ll come home as heroes but somehow, I don’t think there’ll be any words to assuage the heartbreak. This appears on the Monday, June 30, 2014 edition of the Business Mirror. The great ones can be infuriating. It seems that with genius comes a certain appetite for self-destruction and in doing so leaving many hurt in their wake. For one to be great, it seems there must be the requisite flaw or chip on their shoulder. Why else can people like John Lennon write pop gems of timeless beauty? Why can Babe Ruth consume a bathtub of booze and crush a baseball into the stands like it was an annoyance? And there’s Luis Suarez who is a world-class football talent whose footwork if I may dare matches the great Ronaldinho and catches defenders flatfooted. Luis Suarez began the 2013-14 football season on the shelf for biting Branislav Ivanovic. And now, he ends it on shelf once more only this time for biting Giorgio Chiellini. In another case of awful symmetry, he wasn’t there when Liverpool needed him at the starts and he certainly wasn’t there when Uruguay needed him at the end of their World Cup campaign. That Suarez is a habitual and repeat offender leaves a lot of people devastated. For sure, he is coveted for his ability to score goals. And to a fault that’s because he can help a side win. However, there comes the warranty for the trouble he brings – suspensions and controversial incidents. What he brings to the table for La Celeste is indisputable. Without him in their first match, Uruguay lost to Costa Rica, 3-1. With him in their sky blue kits, they defeated England, 2-1, and Italy, 1-0. 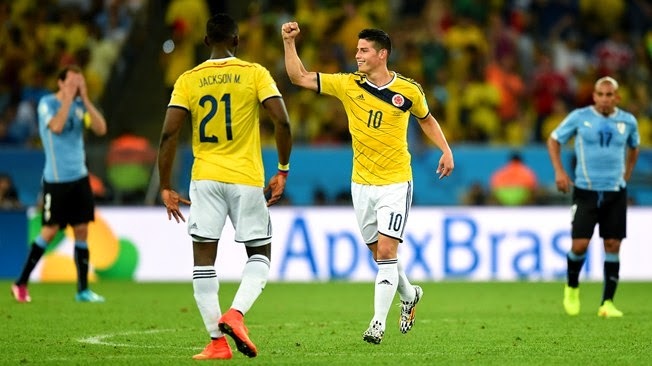 Against Colombia in the Round of 16, the fell, 2-nil, with his suspension obviously a huge factor in the match. For the supporters of Liverpool, he is the Premier League’s reigning player of the year. They came very very close to winning their first Premier League title with Suarez scoring 31 goals total. His denial of the biting incident is both appalling and disappointing. Maybe if this was the first time that it happened but no. This is the third. With regards to the Chiellini incident, he said that he lost his balance. He sounds like that mother who apologizes for her kid running into the doorknob. Instead of being remorseful, he, along with his compatriots blame England and Italy for conspiring against him. He conveniently forgets that he brought all this upon himself and no one else did anything. Here is a man who is only loyal to himself and the riches that the sport rewards her goal-scoring sons. He forced a transfer from Groningen to Ajax and when the opportunity presented itself, to Liverpool. And after seemingly worn out his welcome, he hoped to latch on to either Barcelona or Real Madrid. He forgets that instead of fair play it’s fair game. At whatever the cost to country and club. He is like Italy’s Mario Balotelli, insanely talented but a ticking time bomb – ready to sink his own side just as he would an opposing team. A return now to Liverpool let alone England is not only awkward but also potentially dangerous. Some of the club’s legends including former teammate Jaime Carragher have called him out. For sure, opposing fans will not let him off the hook and taunt him mercilessly. Not only will he continue to be a nightmare for opposing defenders and goalkeepers but he will also continue to be a public relations nightmare for Liverpool. Uruguay too will have pick up the pieces of a shattered World Cup dream. In South Africa in 2010, they were the surprise of the tournament. But even their march deep into the tournament was tainted by a handball (but the true blame should be laid at the feet of Asamoah Gyan who missed his penalty). In Brazil, they weren’t taking anyone by surprise. And what was supposed to be a huge victory (already tainted by the controversial sending off of Claudio Marchisio leaving the Azzurri with 10 men on the pitch) over Italy felt like a loss in the aftermath. Furthermore, Suarez’ coach and teammates (not to mention his countrymen) defended his actions and scored FIFA for what they perceive to be a conspiracy (they forget that Marchisio was sent off that helped their side win the match). He’s the Barry Bonds of football, loathed everywhere else but cheered in San Francisco. But even that support is bound to wane if he doesn’t show remorse or even makes up for his actions. More so when people wake up to the fact that in their last wins in the last two World Cups were tainted by a Suarez infraction (that made him ineligible to play in their next fixture that they ultimately lost). Waking up from denial can both be liberating and painful. We’ve already written about how San Beda is the hands-down favorite to win a fifth consecutive NCAA title. We also mentioned that some teams will contend – Jose Rizal University, University of Perpetual Help, Colegio de San Juan de Letran, College of Saint Benilde, Arellano University, and Lyceum of the Philippines University. Those six teams will not only need to be creative but will need all hands on deck to defeat a de-powered Red Lions squad where the advantage of Ola Adeogun is even more marked because they have no one to match up against him. That leaves us with four teams who look to bring the rear. The San Sebastian College Recoletos Golden Stags will go where CJ Perez goes. The second year forward is their only creative force and without him on the floor, the Stags struggle. This team is already far removed from its Pinatubo Three days yet they have struggled to add key pieces to the puzzle. Perez was a terrific addition. But the one and done Leo de Vera hurts. De Vera was just as versatile if not clutch for this time. But knowing head coach Topex Robinson, he’d rather talk about the present team and its young core. To put it bluntly, they are in rebuild mode and they have some raw but exciting players who could help their campaign. There’s Michael Calisaan and Rhanzelle Yong, reed-thin forwards who can shoot and drive to the basket. When they get on a streak, they are capable of strapping the team on their backs. Two other holdovers from their title days with the Pinatubo Three are Jovit dela Cruz and Bobby Balucanag. This is Dela Cruz’ time to shine but in the summer he was making bad decisions with the ball. But that is why you play in the summer – in order to correct the mistakes. Jovit needs to step up his game and help Perez not only in scoring but to get this team on track via creating shots for teammates. Balucanag should get t in his head that he will need to rebound and play defense. Bradwyn Guinto has good moves inside the paint but is almost entirely dependent on gimmes from Perez and company. If Guinto can stay in the game, he will help. But he will need protection from his teammates who don’t seem to understand team defense. In case you noticed I didn’t mention their point guard position. Exactly. What point guard position. Emilio Aguinaldo College.... if Cedric Happi Noube is healthy, they will have that all-around stud to help them compete. Happi in and out of the lineup during the summer due to health issues, EAC struggled. They showed flashes of potential. Sidney Onwubere seemed to get it right towards the end where he made good use of his athleticism to score and grab crucial boards. If he can be consistent in his scoring and make better decisions, he will be a force. He’s blessed with freakish athleticism. If that maturity sets in, along with Happi, EAC could be a force. This is a team that likes to bombard from the outside. But the Generals have to remember that they aren’t dealing with entrapped Guardia Civil during the Revolutionary days. They’re in the NCAA. Just as in any league, for them to compete, they have to do it inside the alligator wrestling pond that is the shaded lane. John Tayongtong, Jan Jamon, and Igee King look good when they are on fire from the outside but if recent NCAA history has shown that any title dreams means having to dominate the inside. And that leaves us with Mapua. No team has dropped in form and competitiveness more than the Cardinals. Several years ago, they had a good team with some gamers. Now, not even their best all-around player in Josan Nimes is in uniform. Nimes is not in uniform due to grades or injury depending on whom you talk to. Whatever it is, not having him, gives them even more problems. That places more pressure now on Joseph Eriobu to play better and smarter (just like EAC’s Onwubere needs to step up). Because right now, their best player is center Jesse Saitanan and they will not only need to feed him the ball but to help him stay in the game. They still have Jeson Rey Cantos, Hesed Leo Gabo, and Carlos Isit to help but this team will struggle as they need to find consistency. Without Nimes, as it is, there isn’t time to figure out who is their go-to guy much less how to attack opponents. They looked lost, uncoordinated and lacking in motivation during the summer. Here’s hoping that it doesn’t carry over into the NCAA season or else it will be a long long and lonely one at the bottom. I am the point where Luis Suarez’ brilliance can no longer cover up for on and off-field disciplinary actions. As a lifelong Liverpool supporter, I can no longer condone his action and wish to see him away from Anfield lest he continue to tarnish the club’s name, image, and what is on the road to achieving. For sure, Suarez is a talent; an all-world player who can change the outcome of games with his presence. And that is the beguiling problem. He can win ballgames but he also brings ulcers, headaches, and the wrath of social media upon you. Suarez can check possibly the first four characteristics but not the last which is just as important. Suarez first came to my attention when he was a player for Ajax Amsterdam which happens to be the Dutch club that I support. He was an incredible player who soon found himself in rare air with the great Johan Cruyff, Marco Van Basten, and Dennis Bergkamp who also starred for the club. In the middle of a suspension after biting PSV Eindhoven midfielder Otman Bakkal, Ajax, perhaps tired of Suarez’ numerous suspensions and disciplinary problems dealt him to Liverpool. I was ecstatic but wary. I thought that maybe he had worn out his welcome in Amsterdam (although he departed the club on good terms) but I took note of the manner in which he departed his first Dutch club, Groningen, where he tried to leave as soon as a bigger club (Ajax) expressed interest. Groningen didn’t accept and even won an arbitration case. Only when Ajax doubled its fee was he released. Before joining Liverpool, there was another red flag as Suarez deliberately slapped a shot by Asamoah Gyan in the 2010 World Cup. He was sent off for his trouble. And to Ghana’s chagrin, Gyan missed the penalty that would have seen them through. Unlike others who called Suarez’ handball an act of cheating I don’t think so. That is no different from a deliberate tackle to save a possible goal off a breakaway. That is no different from what Marco Materazzi did to get into Zinedine Zidane’s head in 2006. On to Anfield where he starred to give the Merseyside club its first deep threat since El Niño was in these parts. Then came the racist abuse of Manchester United’s Patrice Evra and the biting of Chelsea’s Branislav Ivanovic. The Uruguayan received an eight and ten-match ban (aside form the fines) respectively for both incidents. Suarez proclaimed his innocence with regards to his remarks about Evra and caused further controversy when he refused to shake the MUFC captain’s hand in the pre-game tradition causing further embarrassment for Liverpool. That he also did not agree with the ten-match ban seemed like he did not appreciate the seriousness of his actions. In the midst of a tumultuous stay in Liverpool, Suarez tried to force a move to Arsenal prompting further discipline from the club. This reminded me of his time with Groningen and his apparent disrespect towards clubs in order to further his own career if not agenda. Now in the midst of this wondrous World Cup in Brazil, there has been talk of him leaving for a Spanish club. With that in the backburner, Suarez capped it off with another mad incident wherein he bit Italy defender Giorgio Chiellini; an incident missed by the referee or the linesman but caught on camera in all its gory detail. What made it even catastrophic for Italy was not only did Suarez avoid being sent off but Uruguay scored off a corner shot mere moments after the incident. This when they had played well despite being a man down after another controversial decision where Claudio Marchisio was dismissed for a challenge. If they sent off Marchisio for that then why wasn’t Neymar given a red card for a blatant elbow against Croatia’s Luka Modric. But the more grievous crime was Suarez’ insatiable hunger… for controversy and egregious defiance in the face of obvious evidence. I have no idea what FIFA will hand down to Suarez. It could be a lengthier ban and another higher sum. Whatever it is, I think it is time that Liverpool take the high road and not bring back Suarez. This man has serious issues about morals and ethics. He is highly disrespectful and with no regard for history and authority. It pains me to say that considering what an important player he is for the Reds. But the club has a code of ethics and no longer can anyone turn the other cheek to someone who has no regard for the rules as well as his club and country. Enough of this nonsense. It might be harder to win that elusive Premier League title but at least we will do it the right way.